Despite winning the title in 2005, the Indians went into the 2006 season with a lot of questions. Gone were two starting infielders, a starting pitcher, and their manager. But with new faces, new uniforms, new leadership, and new expectations the Indians took the field in 2006 in much the same way they left: with a notch in the win column. With early season wins of 17-0, 23-5, 7-1 and 16-0 the Indians rolled through the first two months of the season firing on all cylinders. The first true test of the young season came in Salinas in late July against a Dodger team with outstanding pitching and strong defense. The Tribe carried a 9-0 record and a 12-game winning streak (dating back to the previous season) into the weekend doubleheader. Unfortunately the streak ended that day but, despite a tough loss in the afternoon finale, troop morale was strong after the offense managed to beat a very good pitcher in the morning game. Two weeks later the Indians suffered another loss to the Reds and their potent offense on a red-hot 100 degree summer day in Cupertino. That would be the last division loss of the regular season. Throughout the remainder of the summer and leading into the playoffs, pitching and defense seem to consistently carry the club in the morning games while the offense would out-slug the opposition on the afternoon side of the double-dip. The regular season charge was again spearheaded by starting pitcher Jaime Parady, who enjoyed an undefeated regular season on the bump and another sub 2.00 ERA throughout the regular season. On the offensive side of the ball third baseman John Dietz was the team's most consistent threat with a near .450 batting average, a rash of timely hits against the league's best arms, and the team lead in homeruns, batting average and slugging percentage. The end result was another division title. The playoffs were on deck. The first round pitted the #1 seeded Indians against a #4 seeded Dodger team that had previously beaten them with strong pitching and mistake-free defense. This time around it was the Tribe that played 9 innings of error-free baseball to seal an 8-1 victory and advance to a 2nd round match-up against the #2 seeded Diamondbacks. Having seen this same D-Back team the summer before in the 2005 championship series and twice during the 2006 regular season, the consensus throughout the Indian's brain-trust was that this was the team to beat, regardless of their head-to-head regular season record. The Diamondbacks matched up well, had dominant starting pitching, talent throughout the batting order, and had a reputation for playing the Indians hard and fair. A win secured one of these teams a spot in the finals. A loss meant an elimination game the following weekend to qualify for the championship series. The game lived up to expectations. In one of the best played battles of the season, defense and pitching dictated the flow of the game and when the 7th inning began the teams had locked horns at four runs a piece. The Diamondbacks produced their first lead of the game in the 7th inning on a groundball down the 3rd base line. Despite the momentum shift, the Indians fought back and rallied in the 8th inning with a pair of doubles and a run scoring single to take the lead back for good. The Indian victory meant a return to the finals for the second year in a row and the fourth time in the last five years. After winning their elimination game the following weekend and therefore qualifying for a return trip to the finals, the Diamondbacks were poised to exact their revenge on a confident Indians group going into the mini three game championship series. It would be a rematch of the fiercely competitive 2005 finals. Game One was played in Salinas and went to the D-Backs convincingly, 11-4. With their first loss of the playoffs, their first taste of defeat in well over a month, and their worst defensive effort of the summer, the Indians were a loss away from the end of their season. It was familiar scenario though, as the previous season's championship series saw the Indians at Cupertino, against the Diamondbacks, down 1-0 and facing elimination. The odds were definitely against the Tribe catching lighting in a bottle twice. Down 1-0 in the series, it was critical that the Indians jumped off to a quick start in order to capture early momentum and confidence. 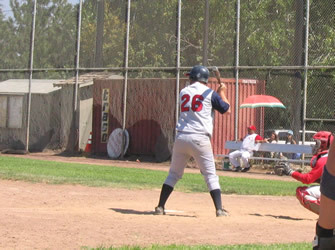 Lead-off hitter Tino Barragan did exactly that with a 1st inning, line drive homer over the left field fence. It was just a solo homerun and a single point on the board but, at least for the rest of the Indians team, it was a tremendous shot in the arm, had drawn first blood, and served to kick-start an offensive frenzy that eventually put a baker's dozen into the scorekeeper's book before Jaime Parady recorded the final out some three hours later to secure the 13-6 playoff win. It was a complete game victory for the Indian's ace, his 5th of the season, but it also allowed the Indians to even the series without digging into the bullpen. Game Two was shaping up to be another epic battle between the Indians and Diamondbacks. The championship game would put two of the league's best arms against one another. The Indians hoped to ride Biernat's hot hand while the Diamondbacks looked to Sherman, their most dominant starter, to take the title away from the Indians. 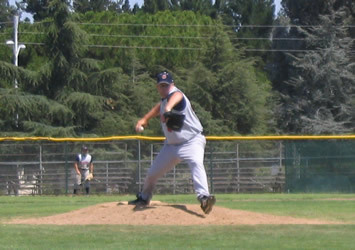 In both the win at Sobrato and the loss at Hartnell, Biernat appeared to have the upper hand against many of the Diamondback sluggers in his 4 innings of relief work. Conversely, in the August 27th playoff game at Sobrato, Sherman yielded very few scoring opportunities to the Indians offense despite the loss. As expected, the 1st half of the game was an absolute cage match between the two hard-throwing right-handers. Consequently the two teams were stalled in a scoreless tie. It wasn't until the 5th inning that the Indians broke the ceasefire by manufacturing a run to take a 1-0 lead. Two innings later the Indians offense lengthened its lead with pair of runs. It was a margin they wouldn't relinquish and the Indians eventually won the game 8-4. It was a repeat title win for the Tribe and their third in the last four years. The core group and leadership of the team remain intact. And with the addition of some key players to the roster in the off-season, the Indians are focused on a 3rd consecutive title in 2007.